1 portion (28 g powder = 1/2 scoop) dissolve in 250 ml 1 of water. Consume immediately after preparation. Take one or two servings a day at any time, especially recommended between meals and after physical exercise. The product effectively supplements demands for protein. Women, in particular, may be at the risk of protein deficiency in their diets, especially because they are much more likely to limit the consumption of meat and animal products. 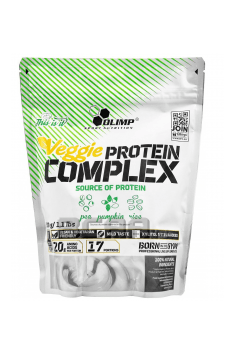 Veggie Protein Complex with a neutral flavor can be a great addition to cocktails or fruit desserts, increasing protein supply without adding flavor. In order to build muscle mass users should not forget about an adequate supply of energy from carbohydrates and/or fats.